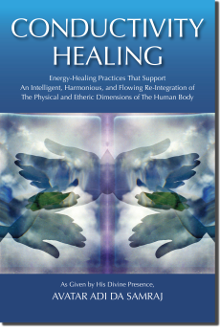 Straightforward and practical guidance on how to understand and practice energy healing. 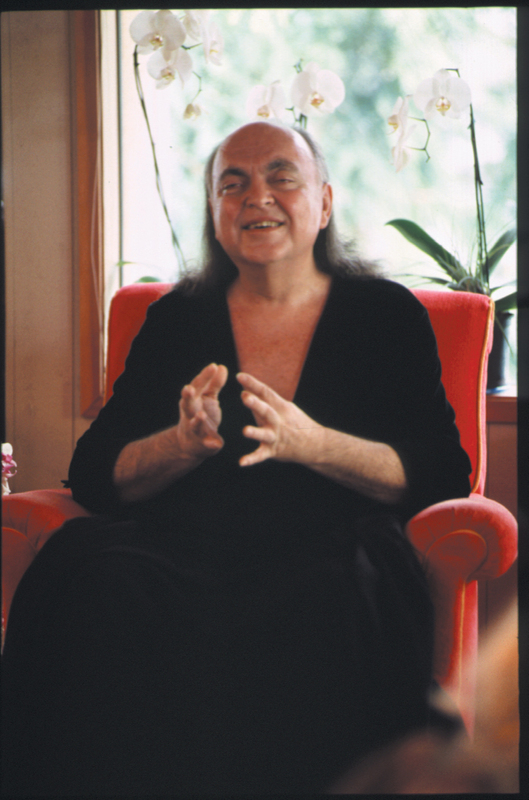 Avatar Adi Da Samraj offers simple practices that support well-being by feeling and breathing and circulating etheric energy—in one’s own case and also for others, through forms of healing touch. "Turn" these flipbook pages for Table of Contents, Foreword, and Prologue! Straightforward and practical guidance on how to understand and practice energy healing. Avatar Adi Da Samraj offers simple practices that support well-being by feeling and breathing and circulating etheric energy—in your case and also for others, through forms of healing touch. But this book is not a “cure” for a “problem”, or a prescription for self-improvement. Rather, it is Avatar Adi Da’s invitation to wake up from the unconscious presumption that our bodies and this world are merely physical—and to become responsible for well-being and true human and Spiritual growth on that basis. If you rub your hands together, and then hold them close but slightly apart, you can feel the energy between them. You can feel there is a kind of vibratory fluid between the hands. What does that mean? It means that the physical body is not merely “material” in some gross, meat-like sense. The physical body is part of an energy-domain. If you go deeply into the physical dimension, you see it is simply energies. It is mainly space. When you get down to the atomic level, there is a lot of space in between so-called “particles”. It is a field of energy. The particles are not particles—when seen truly, they are energy-fields. Everything is energy-fields—everything! There is no “matter”. There is only energy-fields. Everything is an apparition of energy-fields. Everything cosmic, everything conditional, is energy only. There is no matter otherwise. What appears to be matter is a mode of energy. If you get close enough to it, you find matter to be energy. If you get more of a distant view, you feel it as “stuff”. But, in truth, there is no “stuff”—there are only fields of energy. Functioning on the basis of this understanding is fundamental human responsibility. The Reality-Way I Reveal and Give includes that understanding as part of the basic responsibility for practice. Right-life practice is energy-practice relative to the life-domain. Conductivity Healing is a provocative and outstanding book dealing with the complexity of life. In simple terms, Conductivity Healing is about restoring the flow of energy in a direction that supports aliveness, health, and creativity. I’ve always known, as a physician and psychotherapist, that when energy is obstructed, illness and pathology frequently follow. This book—from the Enlightened and highly intuitive Avatar Adi Da Samraj—is an absolute treasure, revealing several methodologies that support harmonious healing frequencies not only for the physical body but for the emotional and spiritual domains as well. I loved reading it. Highly recommended! Energy, the energy body, energy transference, and energy healing are all real. Conductivity Healing, from Avatar Adi Da, adds a very important piece to the complex puzzle of healing with energy and healing with touch—and the simple, universal truth of healing with love. I am a physician who lost faith in the tools I was given to treat my patients, triggering a personal healing journey, and my discovery of the beauty and tremendous healing powers of both energy and the breath. After my life-changing understanding of the nature of health, I incorporated energy healing into my medical practice, and I’ve seen great benefits for my patients. It was therefore with great joy that I received and read Adi Da Samraj’s new book, Conductivity Healing—which I can now enthusiastically recommend to those of you, who, like myself, are seekers on the deepest levels. Enjoy! Conductivity Healing will captivate you, drawing you into the life and spirit of Adi Da Samraj, and the gift of healing he bestowed upon the world—a gift you may find insightful and useful in your healing journey, and the journey of others you serve and assist. Conductivity Healing is an eloquent invitation to go beyond the limitations of physical being and understand ourselves as energy; to consciously be alive as energy and live our lives as energy in relation to ourselves and to others. The book gives a foundation of etheric awareness and describes various practices for magnifying and circulating life-energy. All dimensions of healing are covered—the physical, the subtle, and the causal. It includes many practical exercises to awaken sensitivity, consciously participate with the universal field of life-energy, and facilitate healing on all levels.